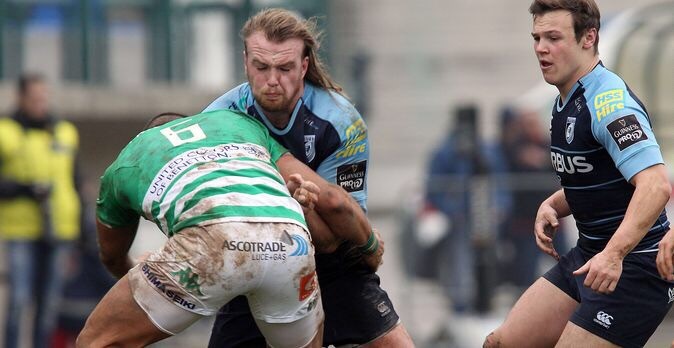 Cardiff fell to an extremely frustrating Pro12 defeat at a very wet and windy at a wet and windy Stadio Monigo to record our first league loss in five games. It means we now haven’t beaten Treviso away since the start of the 2012/13 season, as it increasingly becomes are bogey trip. By all accounts the team were unlucky not to come away with all four points having had all the play, but if you can’t turn possession to tries you only have yourself to blame. The starting XV was boosted before kick-off as both Kristian Dacey and Cory Allen were released to us from Team Wales, while Jarrod Evans was recalled from Wales U20 duty. With only Sam Hobbs on the injury list it meant an almost full Six Nations period squad was available to be picked from, and despite Dan Fish being picked on the wing where perhaps he isn’t the most effective, it was a strong team. Match report wise I only have what has been reported and what was on Scrum V highlights having not watched the game. It would seem we went back to starting slowly, maybe two weeks off since beating Edinburgh not helping with that, only Dan Fish saving a try inside five minutes, but with the penalty already secured Treviso went 3-0 up through the boot of Jayden Hayward. 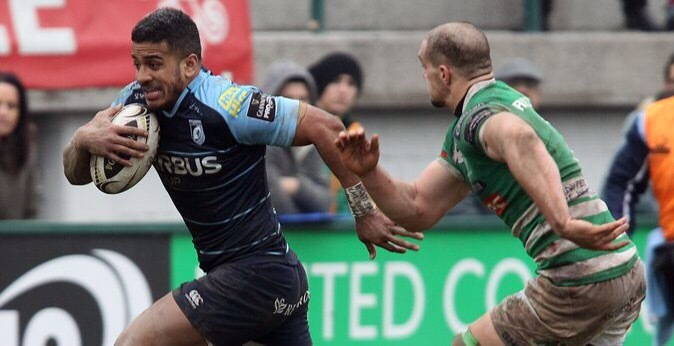 Cardiff were trying to play rugby but a mixture of rustiness and the cold and wet conditions contributed to a high number of enforced errors. There was also a lack of discipline in defence throughout the first 40 minutes as another offside penalty saw Hayward double the home side’s lead. We went to hit back as Rhys Patchell put us into the corner from a penalty, but not for the first time a lack of killer instinct couldn’t gain the try. Back and for the game went until five minutes before half-time when Treviso delayed a line-out giving us a free-kick. The forwards rumbled up to the line before Jarrod Evans got control of the ball, put it through the hands of Cory Allen and Patchell to find Blaine Scully who snuck over in the corner for his first Pro12 try. Another opportunity came and was wasted by conceding a penalty, so somewhat undeservedly we were 6-7 up at half-time, but in the lead nevertheless. 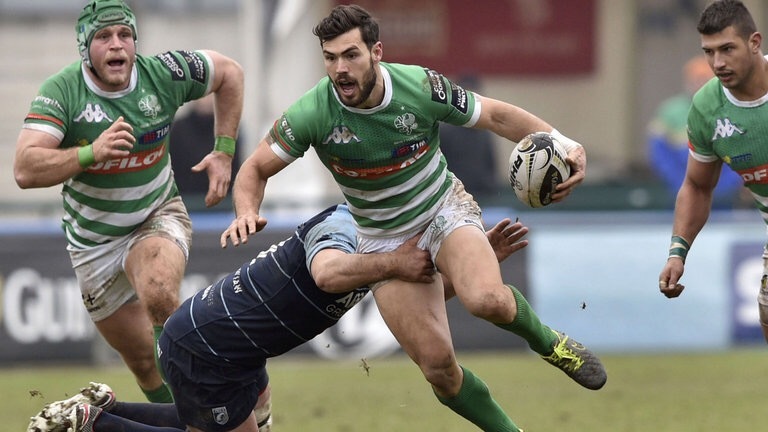 Until 10 minutes after the break anyway, when Treviso really turned the screw at scrum time. Our pack were marched backwards, and after two penalties, referee Dudley Phillips went under the posts. Interestingly, in the Six Nations on Saturday, Scotland infringed three times at a five metre scrum against Wales with no action taken. However, the standard of refereeing is another topic. What ensued following Hayward’s conversion was essentially 30 minutes of attack and defence as Cardiff pushed to take the win. 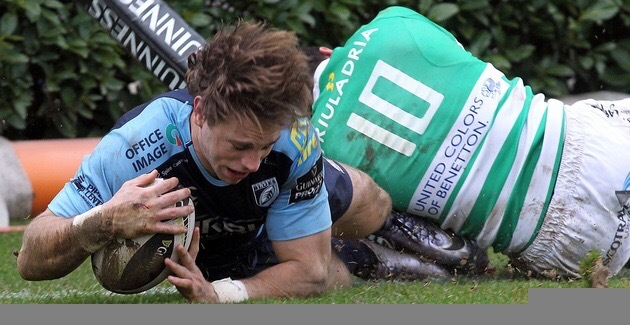 Line breaks from Scully, supported by Tomos Williams, and Aled Summerhill, supported by Ethan Lewis were scuppered, meanwhile Manoa Vosawai was twice held up over the line. We had scrum dominance and all the ball, but desperate Treviso defending or silly mistakes cost us. For the second game on the bounce we’ve scored just one try and failed to score a single point in the second half. We’ve managed to do that despite dominating both Edinburgh and now Treviso in successive games. A lack of killer instinct, particularly in midfield, has meant we’ve scored 17 points across the two games, when really it should’ve been closer to 50. If we’d put the bonus point wins on both then we’d be seventh in the table, above the Ospreys on points difference, and four points behind Edinburgh, with a game in hand on both. Unfortunately, we look absolutely clueless with ball in hand. We have extremely talented players in Cory Allen, Dan Fish, Rey Lee-Lo, Rhys Patchell who are all exciting runners, and Blaine Scully has shown he can beat a man or two recently. With Tavis Knoyle providing quick ball and Jarrod Evans offering a solid base for running rugby at 10 there is no excuse to not be making line breaks galore. What it seems to me is that once we get past two or three phases then there is no pattern of play, it becomes a free for all. It comes back to Paul John unfortunately and the need for him to be coaching the right players to get into the right places at the right time. Not easy I’m sure, but at the same time it can’t be hard to coach them to attack better than they are. We do spin the ball wide well, but it’s all very simple through the hands at a pace that’s not quick enough to attack properly. They either need to be practising some midfield variations for when the ball goes wide after a few phases, or have the confidence to back themselves to straighten the line or go for the break. They are good enough to do that, they just have to believe. Obviously John is moving away from attack coach to ‘skills coach’ next year and incoming Bristol man Matt Sherratt has a big task on his hands to reform this timid set of backs, but fingers crossed he has the same effect Danny Wilson and Graham Steadman have had. We now go in to a tough run of game against Ulster, Glasgow, Munster and first up, Leinster at home next week. A crucial set of games if the squad are serious about a top six finish. Come on Cardiff! !